Russ Canzler Rounding Third Base, July 3, 2011. For Durham Bulls fans, this is just about the worst possible news we could have on this last day of January. Russ was our star in 2011 and now the only way we’re going to see him back is if he doesn’t make the Cleveland starting roster and he shows up in a Columbus Clippers uniform. (Good Grief! A Clippers uniform! ). 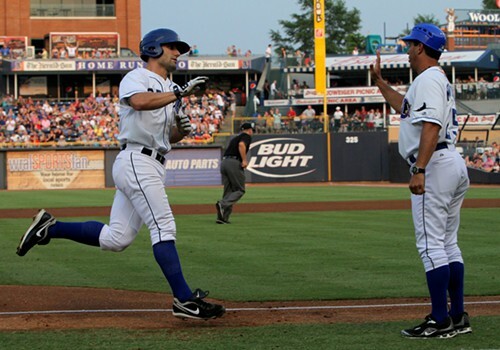 Played in the most games of any Durham Bull (131) and had the most plate appearances (549). He led the Bulls in batting average (.314), was second in OBP (.401) and was first in SLG and OPS (.530 and .930), and led the team in wOBA (.399). His 83 RBI were way ahead of #2, Leslie Anderson, who had 65. He also led in home runs (18), doubles (40), second in triples (5). He was the team leader in walks (67) and strikeouts (129). The all-around offensive star of the year. We started to worry when we read that he'd been designated for assignment. Then today we learned that he'd been traded to Cleveland. The other side of the coin is that a serious minor league fan really does want the best possible outcomes for the players we get to watch, and this looks like a pretty good deal for Canzler. The folks in Cleveland seem to think a lot of him. He’s been put on the Cleveland 40-man with a solid opportunity to compete in spring training for an opening day slot. So, we’ve got to wish Russ the best and hope that we don’t see him back in the DBAP in a Clippers uniform. We’ve had enough of losing to those guys. Would hate to have it come at the hands of a former Bull. Now it looks like Dan Johnson might be back at the DBAP in a different uniform, too. Signed a minor league deal with the White Sox. It will be an interesting year for the Bulls. I'm gonna have to do another complete post with all this news. Johnson to White Sox — meaning he and Ray Olmedo could be in Charlotte next year. And Canzler was even a cooler guy than we thought (see Orin Day's comment). Also worth noting that in addition to IL MVP that Canzler won the 2011 Goodmon Award for Community Service and the Bulls Fan Favorite award. So to sum up all of the above so far: Russ was the best player in the league, he helped lead the Bulls to a division title, both his Bulls teammates and Bulls fans liked him, and he did good things off the field during his time in Durham. I hope we'll see him on the field in Cleveland sooner rather than later! April Fool's Day Comes Early?